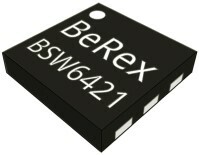 Seoul Korea, February 1, 2018 - BeRex announces the availability of the BSW6321 and BSW6421 high isolation, high linearity, low insertion loss, SPDT switches optimized for Wi-Fi, CATV and 5G applications. Using a single 2.7 V-5.5 V supply voltage, the BSW6321 and BSW6421 switches provide a wide 1 to 6000 MHz frequency range when used in either 50 Ohm of 75 Ohm systems. They utilize a patent-pending technology that provides the industry's highest isolation of 50 dB at 2.45 GHz, together with a high input P1 capability of 39 dBm and a linearity of 64 dBm; optimizing these switches for use in 802.11 a/b/g/n/ac/ax Wi-Fi, DOCIS 3.1 CATV, NFC, IoT and 5G wireless applications. 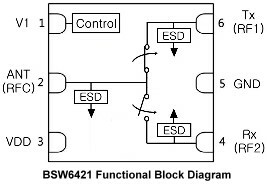 The BSW6321 and BSW6421 are available in a 6-lead, 1.5 mm x 1.5 mm UDFN package, have an ESD rating of 2500 V (HBM) and require no external DC blocking capacitors.